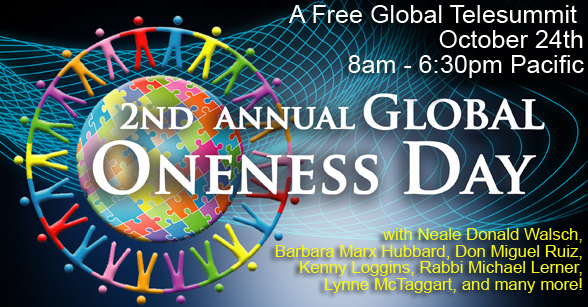 We’re delighted to invite you to Global Oneness Day, a free virtual event on October 24th with more than 30 luminaries such as Neale Donald Walsch, Barbara Marx Hubbard, Kenny Loggins, don Miguel Ruiz, Gangaji and Lynne McTaggart. Plus, when you register for the Global Oneness Summit you’ll have the opportunity to add your signature to the Global Oneness Day Declaration. Our goal is to send at least 100,000 signatures to the UN on October 24th! Please join me, and tens of thousands of people all over the world, to celebrate the oneness of life and help us spread the spirit of oneness far and wide. P.S. You really are NOT alone. And when you participate in Global Oneness Day you will see and feel the extent of YOUR Global Family. Ambassador Anwarul K. Chowdhury, Andrew Harvey, Anna-Mari Pieterse, Barbara Fields, Barbara Marx Hubbard, Barbara Nussbaum, Barnet Bain, Bruce Lipton, PhD, Ciro Gabriel Avruj, Claudia Christine Pieper, Daniel Gutierrez, Dee Meyer, Don Miguel Ruiz, Dr. Dumisani Magadlela, Dr. Johann Broodryk, Dr. Mathole Motshekga, Duane Elgin, Elisabet Sahtouris, Emmanuel Itier, Federico Mayor Zaragoza, Francine Corbeil, Gangaji, James Twyman, Kenny Loggins, Lynne McTaggart, Maha Elgenaidi, Maria Elena Ferrer, Marla Maples, Nancy Roof, Nannette Rogers Kennedy, Neale Donald Walsch, Rabbi Michael Lerner, Rev. Canon Charles P. Gibbs, Rev. Deborah Moldow, Sequoyah Trueblood, Shalini Ajoodha, Shyla Nelson, Stephen Dinan, Stephen Simon, Steve Farrell.